Easy to Use: Step-by-Step voice instructions, including CPR coaching, with our Life Guidance feature. 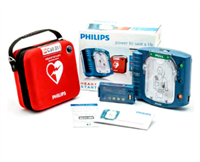 Safe: Trust the innovation of HeartStart Home, the first and only defibrillator approved by the FDA for home use and available without a prescription. Reliable: Deliver shock treatment after CPR, typically within 8 seconds, with our Quick Shock technology. Survival from SCA decreased about 10% with every passing minute without treatment.